Time Stamp- Way Fu Industrial Co., Ltd.
A timestamp is the time at which an event is recorded by a computer, not the time of the event itself. In many cases, the difference may be inconsequential: the time at which an event is recorded by a timestamp such as entered into a log file should be close to the time of the event. 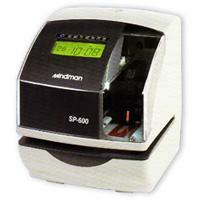 The time stamp, SP-600, is equipped with the most options available in a multi-functional electronic time recorder. The SP-600 is designed to assist with all types business tasks including: Time recording, job timing and time, date, numbering along with message printing. Versatile and economical, this recorder prints what you need on what you want! In 2001, we made a major breakthrough on our research and development, and brought out the micro-computer timer with the latest in time recording technology which can now be found in our Mindman M-200 and Kings Power KP-210 series. Hence, if you have any interest, please contact us for detail about timestamp. Battery back-up for printing when power is off. Built-in relay to operate external sounders. All functions of the time stamp are quickly and easily customized to meet your exact business requirements.Built-in battery backup for time, date and memory auto-reset after power failure, never needing to be reset. Automatic month-end and leap year adjustment. Left or right hand margin printing. Large illuminated print window for accurate alignment of document. Printing options include Manual, Automatic, Semi-Automtic and Combination. 1 to 8 digit numbering : Up to nine repeats. Selectable printing : 29 preset formats such as '19 jan 2004 11:00'. Customizable time stamp printing : Up to three separate lines. Selectable print formats : See chart on the left. 12 or 24 hour print format. Regular minute or 1/10, 1/100 or 5/100 of an hour 13 pre set comments such as FILED, SENT, PAID. Prints in English, German, Spanish, French, Italian or Portuguese. Password for program protection' * 'mark for irregular printing, programmable by each day of the week.